One of my reading goals this year is to finish at least 5 series I started way back when - and it is ridiculous how many I have to choose from. 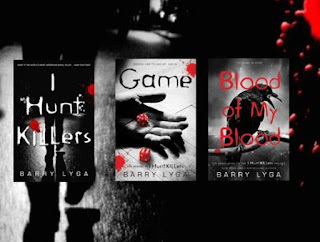 But at the top of the list was Barry Lyga's Jasper Dent trilogy. It had been forever ago since I read the first book, I Hunt Killers, but I remember loving it (see original review here). Simple premise. Jasper Dent is the son of one of history's most notorious serial killers, Billy Dent. Billy was captured by the small town sheriff and is rotting away in jail, but when a number of mysterious murders start to devastate the town, Jasper starts to worry that his father is working with someone on the outside, but even worse, he worries that all his father's lessons on profiling and murder are leading him down the same path. I'm kind of addicted to crime shows. I love Dateline, podcasts that highlight criminal activities, and Law & Order. I don't like horror and gore, so I'm not quite sure why that type of entertainment resonates with me, but it does, in a completely not morbid way. If you share the same proclivities, you'll probably love this story. Lyga takes you into the head of a serial killer which is totally messed and intense, and yet, there is something very redeeming and thoughtful about Jazz. The pacing is spot on with several moments of serious tension and enough breadcrumbs to keep you guessing on what is going to happen. All three books in the series are solid, moving the story forward and never falling off with plot or character development. Without giving too much away, I only had two problems with the series. Jazz's girlfriend Connie and a final conversation her father has with Jazz. Connie was that person in a horror movie that you're yelling at because they keep doing stupid things. In all honesty, I spent most of the series hoping she was going to die. As for the final conversation - it seemed out of place and unnecessary. Thankfully it wasn't a big chunk of the story, but for series that was so strong through three books, I kind of wish it hadn't been in there. Outside of that, an amazing series that keeps you on your toes.